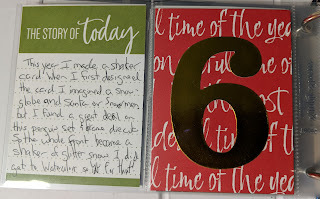 Today my story is about my Christmas card. I made a shaker card and it was quite thick. so instead of putting the card into my album this year I took the watercolor piece and matted it on kraft since my actual card had a kraft frame. 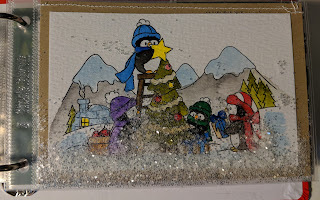 I filled the page protector with the same glitter I used in the shaker card and then sewed the pocket shut. The story of this card was interesting. I sketch out my card idea in August. 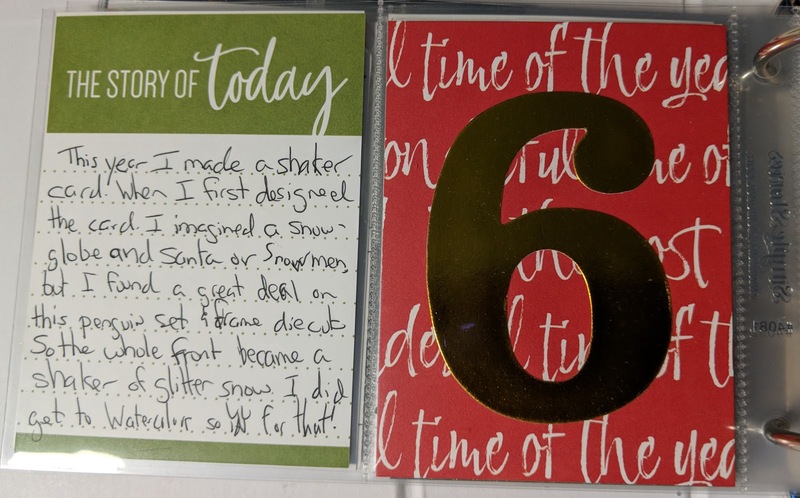 I had planned to do a snow globe shaker that would turn into an ornament. I had also planned to skip the penguins and Copic coloring I had used last year, but this penguin scene was just $6 and I bought it to try. I did watercolor though which is something I've loved this year. I used Tim Holtz Watercolor paper since it was already the size of a card base and white!